Being a seller on Etsy is not as easy as it looks. You can make your job easier by using one of these Etsy fee calculators to determine your actual costs and profits based on your listed sales price. Making the most of these types of tools will bring your hobby more into a business orientated mindset and environment. Get your bookmark button ready! CraftyBase offers a pretty quick and easy reference for taking your sales price, Etsy sales fee, Paypal fee, and product costs to product a quick result on your estimated profit. One issue with this site is how they do not consider sellers who opt-in for Etsy direct checkout. Because of this, there may be slight variation with your real profit outlook. Additionally, there is no way to break down your cost structure as a normal business would do. You can click on the link asking if you know how much it costs to make your products for reference, but be forewarned, it will take you to another link that promotes the sale of CraftyBase’s inventory management software. This software is supposed to perform the calculations for you. I cannot provide any personal experience with how good it actually is. Who knows, you may want to give it a try yourself. If so, feel free to share and comment how it worked for you at the end of the article. One thing I have to say about this site is how I appreciate it starting with the documented date of how current their fees calculations are. You can rest assure that you will be receiving as accurate a result as possible. I also appreciate how they break down the pricing of not only sales, but the shipping as well. You have the costs per item, advertising, shipping, and desired profit all considered here. It makes it easy to just plug in the numbers of your costs as you would be maintaining them in your own financial spreadsheet or system yourself. For payment method options, this calculator offers you more options than I ever expected to see possible from Etsy direct checkout to Paypal domestic, micropayment, non-profit, and a few others. After you are done plugging in all the numbers you get to see the end result of your efforts. 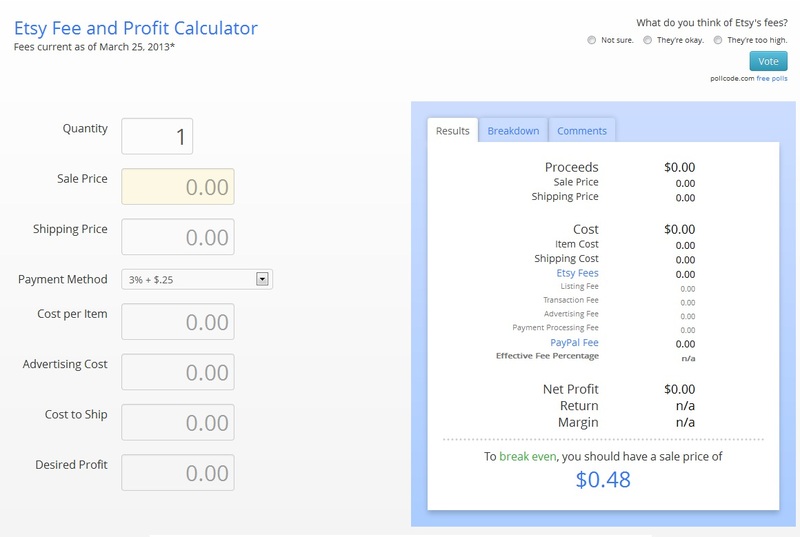 The break-even price is provided as well as your net profit, return, and margin level. I commend the creators of this calculator as I have found it to be one of the best well thought out ones out there made available for Etsy sellers. Have any experience that you liked with another Etsy fee calculator on the web? If so, feel free to share it with our readers and I can add it to the list.